25ppm. Same rated speed even in colour. Max A4, 30 sheet ADF, Duplex, Greyscale/Color, USB Interface, Twain & ISIS, Includes USB Cable, Skip blank page feature. Can utilise U turn or straight thru scanning paper path. 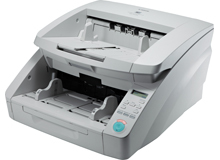 Use Features long Document mode to scan documents up to 3,000 mm. Excellent for reliable distributed office scanning. 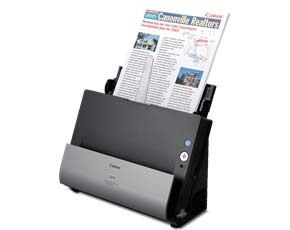 DR-6010C A4 Document Scanner New! Small foot print, 60ppm, Max A4, 100 sheet ADF, Duplex, Bi-tonal/Greyscale/Colour, USB2 Interface, Skip Blank Page, Page Size Detection, Twain & ISIS. Canon imageFORMULA Universal Flatbed 101 New! products. 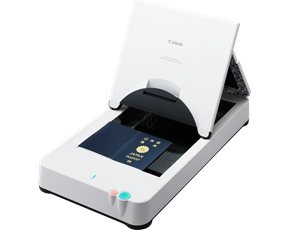 High-speed, high-resolution open scanning is supported by a unique adjustable cover and ambient light control. DR-6030C A3 Document Scanner New! imageFORMULA DR-G1130 Production Document New! Canon imageFORMULA DR-X10C Production Scanner New! The DR-X10C delivers unrivaled image quality at rapid speeds of up to 128 pages per minute and 256 images per minute, in color, grayscale, or black-and-white. The energy efficient and durable DR-X10C, with its operator friendly design, is the ultimate solution for quality production level scanning.